If I'm editing an existing conversation script in PKSV, then let's say the conversation has 19 characters. 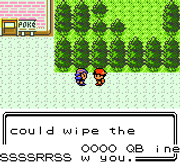 If I edit it so it still has 19 characters or fewer, will it not take up any more data in the ROM? 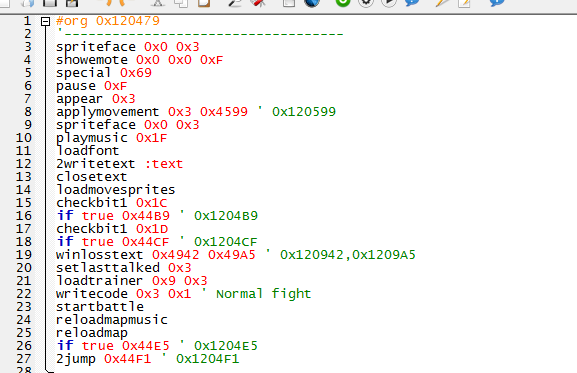 If I edited it to have 20 characters, for instance, would that cause the length of the conversation in the ROM to expand and overwrite other subsequent bytes? Yes, that would make it overwrite other data. Change it to use a dynamic location instead of a specific offset, and pksv will repoint it for you. By changing the "#org 0x2CC00" or whatever the location was on the text to ":text" PKSV knows that this is the label you were referring to earlier in the script, and it will find a free location in that bank to insert it for you automatically when you compile the script. Wow, thanks for the great tip! So I can always just replace the #org offset with :text everytime? What if the bank in which it needs to be placed does not have an area of free space large enough to hold the text? I've never encountered that problem, but a label that uses :word format won't cross a bank, so I'm assuming it would just say that there is insufficient space or some other error when it goes to compile. Alright so I'm not understanding why this repointing of text is not working. I am editing the beginning dialogue of your rival when you first fight him in cherrygrove city. I used the ":text" thing in place of the specified offset and the new text works until it reaches a certain point. Then it just gets completely messed up and forces the battle. Not only that, when I go to talk to a different person the game completely messes up. Why is this happening? That looks like it should work, umm instead of posting it as a screenshot, could you copy/paste it as text (inside of code tags, to make it handy). That would make it easier to see errors by letting me copy what you put in and see what happens when I try to compile it. Also, remember that there are two triggers for this rival battle and they each run similar scripts (with parts overlapping I think). But yeah, if you could paste the script like I did below it would make it easier to check everything out and see where your error is coming in. 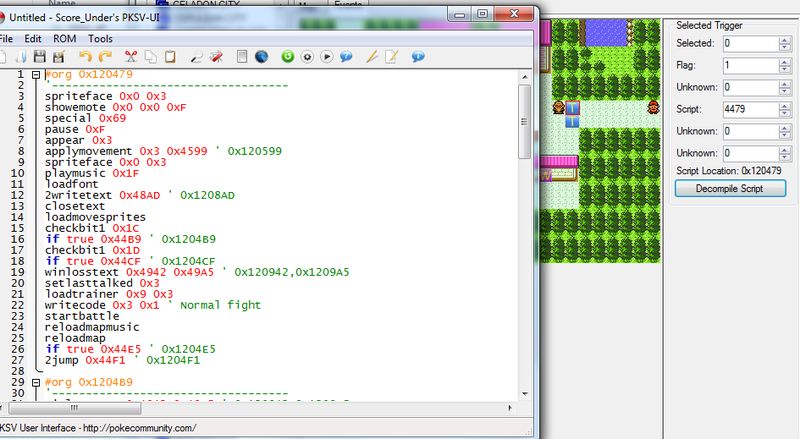 That is the code used in Pokemon Christmas for the battle with Leaf, if you were wondering. OK, it seems as though PKSV's compiler is having issues finding free space that is actually free. When I entered your first code, it entered the text in an area that didn't have enough room, and the movement data was entered in the middle of the text that had already been written. Bugs like this are the reason it took me a long time to ever even want to use PKSV. Since that doesn't seem to be working, I went ahead and found some free space for you. If you change the first ":text" to "0x65B0" and the second one to "#org 0x1225B0" it should work then (And by should, I mean I did a test compile and it worked for me). And you can use that same location for the top and bottom scripts, since the original script had both triggers call the same text anyway. You should move that word to the next line so it doesn't overlap the border. No garbage showing up in the text this way. Thanks for clarifying that! So should I generally not use dynamic offsets with PKSV then? Personally, I don't recommend using dynamic offsets because by doing everything yourself, you can keep track of what's happening inside the rom and know that no glitches come up (and even while doing this, you should create lots of backups). It's easy to repoint data that way as well and what's more, that way you won't end up leaving unused text/script/... data in other sections in the rom. By repointing text data with dynamic pointers, the same text data (with your additions to it) is copied elsewhere but the original text data stays in its original location as well which is not such a good thing.